At the start of 2018, most of the Area Councils in the south-east corner of the state had changes to their boundaries and a change of organisers, and in some areas, new Area Councils were created. This is a snapshot of two of these newly-formed Area Councils and some of the teachers who serve on them. Lou Korbatits "I am one of four QTU representatives in my school. I take a big interest in the roles and responsibilities of teachers in this state and enjoy representing my colleagues when the need arises. I have recently been to Canberra in support of the Fair Funding Now campaign." Donna Prickett "I feel it is important to be a voice for those who feel they have no voice. I believe strongly in being a social justice advocate, fighting for the rights of others." Ann Christensen "I have been an active member of the QTU since 1987. I have been a school Rep in numerous schools and have represented various branches at Area Council in Brisbane North since the late 1990s." Hayley Nizic "I am a passionate advocate for public education. I have worked in a range of schools from Doomadgee to Deception Bay and have a passion for working with students from diverse backgrounds and the issues faced in complex schools. I am committed to representing the voices of teachers and school leaders in Metropolitan North." Edwina Clark "I have been a Union Representative from 1984 onwards and have held the positions of branch secretary, delegate to Area Council and to State Council. I believe that working at Area Council helps by resolving local area issues and ensures that we work collaboratively for success." Kath Simon "I have been a QTU member since 1993 and I am interested in securing needs-based funding and promoting our great state schools." Paige Pope "This is my second year as a Union Rep, my last was at Redcliffe SHS. I received my transfer last year from Murgon, where I am happy to say I met a beautiful lady by the name of Paula Nunan, who is my inspiration for all things Union. She encouraged me to apply for what I could and participate in as much stuff as I could; Women's conference, campaigning for Gonski, Biennial Conference etc. As a Union Rep at Burpengary I am proud to say I am able to help my fellow colleagues out and look forward to what the future brings, especially participating in State and Area Councils, conferences and all things Union." Cath Priday "I have been a Union activist since starting teaching in Emerald in 2008. I have a strong belief in social justice and believe we need strong advocacy for teachers and public education." Johnathan Ennis "I am the Vice President of the North East Brisbane branch and have been teaching for more than 20 years. I believe that supporting staff health and wellbeing is a primary concern." Kay Burke "I have really enjoyed my two years on Area Council. As a forty year Union member and as a Rep at our school for 16 years, I chose to become a member of the Area Council as it enabled me to keep abreast of issues occurring in other branches and actions taken to deal with those, as well as learn from other members and guest speakers who present at Area Council. Often as members we can feel isolated at a school and branch level, but as an Area Council member I feel I have an opportunity to collaborate and liaise with other like-minded individuals and make a contribution which will benefit all of the teachers in our state. 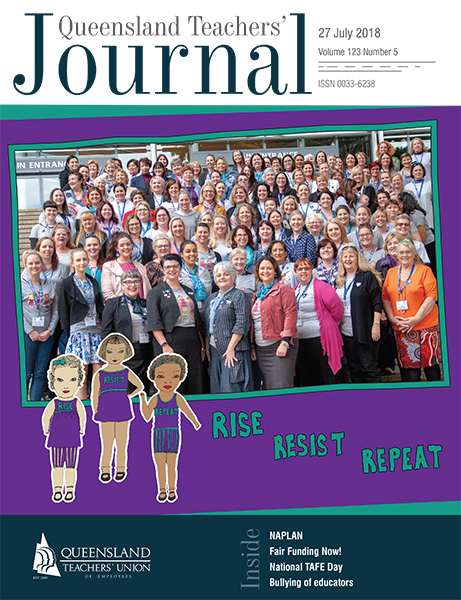 Being a member of the QTU is important to me, because it means that I, along with thousands of other teachers, can contribute to our profession and ensure that teachers are treated fairly and rewarded for the effort that they undertake to ensure that each and every student receives the best education possible." Rod Iffinger "I have been a teacher for 31 years and have worked across a wide range of education settings, including primary and secondary schools, school support centres, regional offices and central office. Since 2000 I have been a deputy principal at Corinda State School, where I am also a QTU Principal Union Representative and QTU LCC member. For much of this time I have also held positions on Sherwood Branch Executive and Area and State Councils. I am passionate about working to improve and safeguard working conditions for teachers and to maintain a high quality public education system for Queensland students." Liz Stewart "I have been teaching for 50 years. Currently I am at Yeronga State High School, though I like to think of myself as the consummate professional public servant, having previously taught in Mt Isa, Malanda, Toowoomba, and some Brisbane and Ipswich schools. I hold a Bachelor of Arts, a Masters in Arts (Hons German), a Certificate in Teaching and two diplomas in speech and drama. I became a Union Rep many years ago following an event at a school where the principal wanted to disobey a directive from the QTU. This was presented to the teachers at a quickly convened lunchtime meeting with a ‘show of hands’ to indicate agreement with the principal’s wishes. I told him that I thought we should have a secret ballot…so we did and he lost. This was the first time that I saw the purpose and the strength of sticking together and I have never looked back since." Melissa Handley "I have been teaching for eight years now and have even more passion for my job now than when I began. I love the connection you can make with students, being able to see them grow and develop as people, and helping them to find their path in life. I teach drama and English but have recently taken on the role of head of department for growth. This new position is concerned with the wellbeing of all students and looks to make sure all students come to school feeling connected and engaged, ready to get the most out of their schooling. I became a Union Rep in my first year of teaching out in Roma and sat on the South West Area Council. When I transferred to Brisbane I was very happy to again take on the Union Rep position at the Gap State High School and attend Area Council for Metropolitan Central. Although my parents are not teachers, they have always been strong unionists and taught me the importance of being an active member and fighting for the rights of all workers. I enjoy the ability to meet with other like-minded teachers and working towards making our industry one that cares for and supports its workers." Daniel Gracey "I have been teaching for 12 years and love having a job that allows me to be creative and involved in people’s lives during their formative years. I spent my first year as a teacher at Russell Island and have been at Dutton Park ever since. When I arrived at Dutton Park, I was the year three teacher. I moved up with the same cohort of students until they graduated to high school – so I got to know them very well. Prior to becoming a teacher, I worked in industrial relations for the management side (please forgive me) in both the rail and medical industries. Working with the QTU as a workplace and Area Council representative has been a rewarding experience." Karen Huntly "I have been teaching for over 40 years in a variety of primary school locations, from Brisbane to Rockhampton (including Bundaberg, Dalby, Jandowae, Gold Coast and Ipswich). I have been a QTU Rep for the majority of those years in those schools. I am currently at Jindalee State School where I am one of two QTU Reps and a QTU LCC member. I have been involved with the Union as a workplace Rep, as well as branch, Area and State Council Rep."
Tracey Hall "I’m a deputy principal at Corinda SHS. My teaching background is English and humanities. I’m passionate about education and truly believe that teachers make a difference. Being a QTU Representative allows me to forge valuable relationships with like-minded educators, as well as support the teaching profession and my colleagues. It’s all about having a voice and being an advocate for workplace representation. I am very much looking forward to a successful and productive year within the QTU." Joanne McKell "I teach at Ferny Hills State School. I love being a Union Rep because I have a reason to talk to everyone and everyone knows that they can talk to me. I believe that in order to get the best for our students we have to get the best for ourselves." Peter Haffenden "I teach humanities (legal studies, geography and history) at Ferny Grove High. I love helping people to secure a “fair go” and to hold the line against the erosion of worker rights. State schools (which my own kids attend) need good teachers and I would like to think I am one of those. Strength in solidarity!" Anna Guppy "I teach science at Kenmore State High School. Having previously been an academic and university teacher for 10 years, I am passionate about science and I want to pass on the processes of science which are fundamental to everything in our lives. I think that teachers become teachers because they want to help people. I became a Union Representative because I also want to help people do one of the most important jobs in our society, and that is to teach the next generation everything they need to survive grow and build themselves and our world. I want to help teachers teach, so I need to ensure that their working conditions allow them to do their job to the best of their ability. I believe that I can help teachers teach by being a strong voice for the Union. It takes a strong personality to be a Union Representative. You are not always liked but you always know that you are doing something to help others."